The San Marino Motor Classic is an event not to be missed! 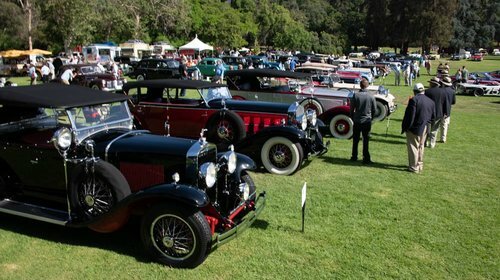 This annual community event brings awareness to the history of motor vehicles from historical automobiles through those of the mid-twentieth century. There’s a lot of options for fun at this multi-day event. Come view a selection of exotic Ferrari’s and a collection of automobile themed watches during the day. On Saturday evening, attend the gala fit with 15 presented cars and the Legends of Swing Orchestra, playing music of their era. Complimentary valet parking, a hosted bar, dinner, and a performance for $250.00/Person included. Want more fun? Sunday holds the San Marino Motor Classic. Stop by and see a broad array of motor cars that span more than a century. Food trucks will be on site serving sandwiches, salads, beverages, and snacks for purchase. Enjoy a gourmet luncheon and an adult beverage in the VIP tent, while taking a rest or watching the awards ceremony. Parking is available on the residential streets surrounding the park. A trolley will run throughout the neighborhoods to bring you to the park entrance. Look for the “Tram Stop” signs. iDriveSoCal was out for all the fun last year, and you can read about it here. Look for us again for some more automobile fun at the 2019!